5 8:27 Last of the "good miles"
6 8:44 Starting to slow up. Legs are kind of dead / tired. 8 9:31 Getting wind directly in the face. 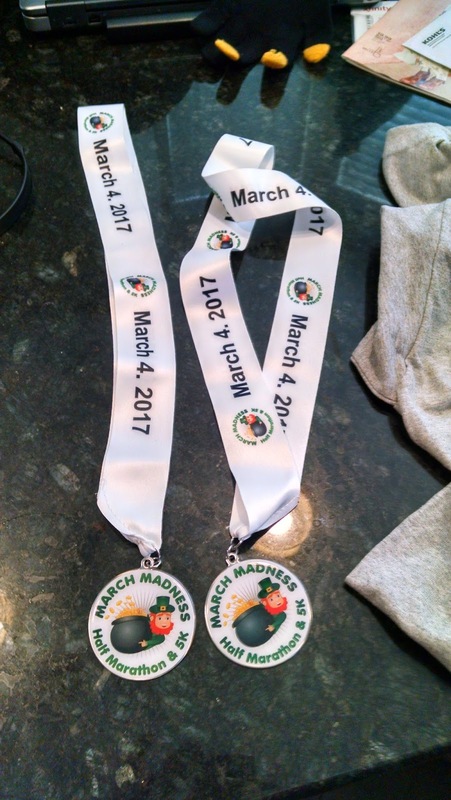 This winter, I got an email from the race director from the March Madness half marathon that I had done last year. It was a small, low key affair for its inaugural race and it was cheap. This email was sent to all the participants of the previous year and had a pretty sweet price of something like $30 for the half marathon. With half marathons costing in the range of $60 on up, $30 was a steal. I had a slot in my calendar and figured why not. The race was at a new location. I have run the course at least a dozen times by now in some variation, so nothing on this race was terribly new. 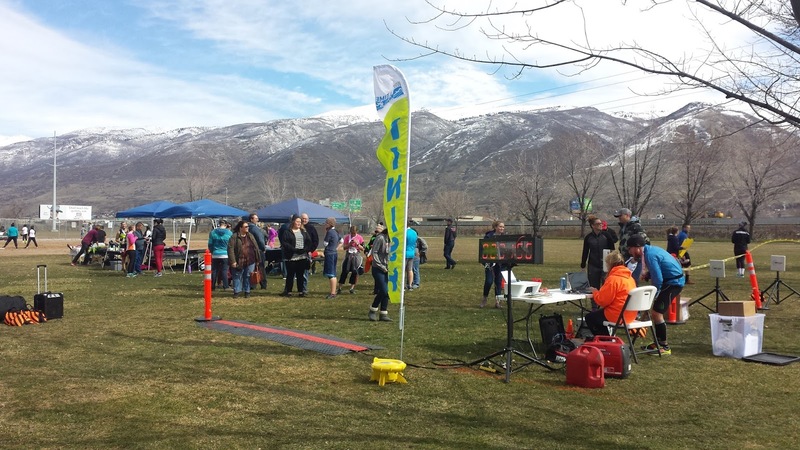 You basically start off in West Bountiful's City Park, run along some residential streets for about a mile before heading onto the Legacy Bike Trail. The bike trail, for the most part, is flat. It isn't terribly scenic, but it is a nice race venue. I rolled in around 8 AM, picked up my shirt / bib easily enough and kicked back in my car for about an hour waiting for the 9 AM start. I knew this race was going to be difficult. One, I am on a high mileage week and I had more or less run 17 miles on Sunday at marathon pace. All week, I've felt flat. I am still also getting over a lingering cold. I don't consider myself sick anymore, but I am still blowing my nose and coughing more than normal. I do feel fine though. Also, there was a wind blowing from the south. If you look at the Garmin you'll notice that this course runs north / south for the most part. I kept telling myself to take it easy for the first half and try and save some strength for the final 6 miles. As soon as the gun went off, I knew I was going out a little too fast. 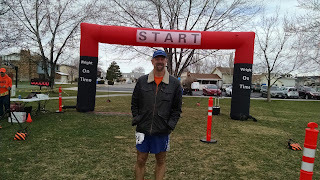 In fact, I hit the 1.55 mile mark at nearly 5K race pace. Oops. It was hard to hold back though. There was a gentle, but not strong, tailwind that was pushing me along. By mile 3 or so, I dialed it back. I knew I was going to suffer the second half and I managed to cut my pace by 15 seconds a mile. The bike trail is mostly flat with the occasional mole hill. There isn't much shelter so you can look around and see the mountains and freeway traffic, which wasn't far. I didn't feel too much of a trail wind but I knew it was helping me. I just hoped it wouldn't be too bad on the way back. I kept looking at my watch for the turn around. My legs weren't responding like I had wanted to and I felt like I was breathing way harder than I should. Even if the race had continued north I think I would've seriously faded... (note to self -- go easy on the long weekend runs the week before a race). I was still running with a group at the turn around but for the most part I was getting picked off by other runners. It was frustrating because I saw my good time getting flushed down the toilet. My heart sunk as well when I turned south and immediately was blasted with wind. Sometimes it was blowing so hard, it was tough to hear. My pace at times came to a shuffle and now there was a monkey on my back in terms of trying to maintain this pace. Inevitably I slowed -- a lot. I made some talk with passing runners and to a person, every one felt like the wind had indeed kicked up from the start of the race. We were all wondering -- did we really have that good of a tailwind? I also couldn't help but notice that the majority of runners were women. There were just tons of them. 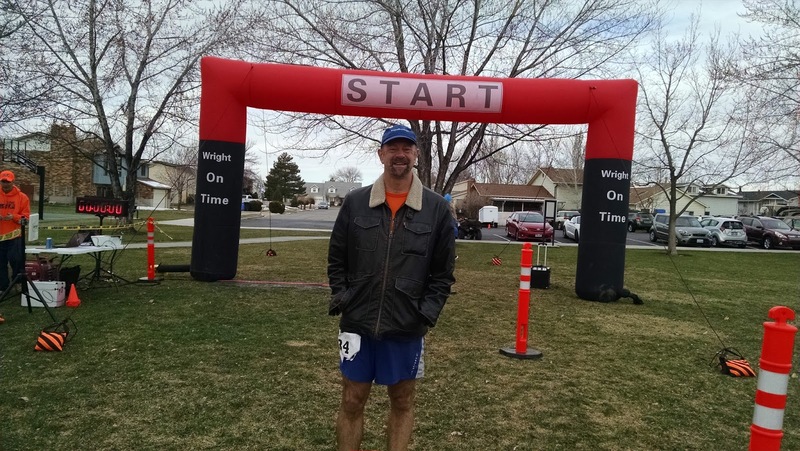 As the final miles came about, I began to question why I was running and I got really down upon myself. This was just mentally hard. 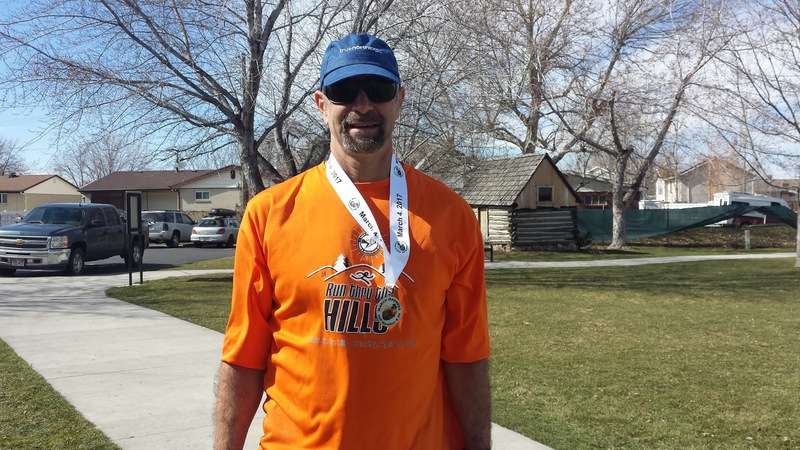 While my pace wasn't too awful, it certainly felt like I was doing the marathon shuffle. 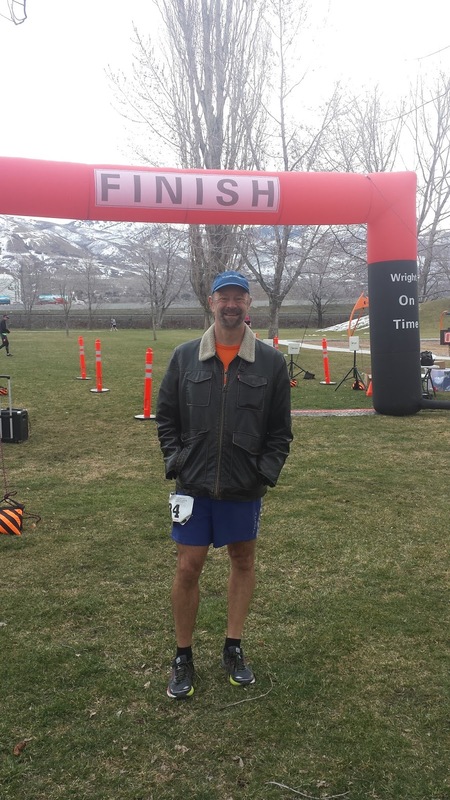 Occasionally I got a brief respite from the wind and I noticed my pace did start to get better, but I had used so much energy while the wind was blowing on me, that it was hard to get any head of steam going. I basically crawled to the finish line and I was just happy to be done. 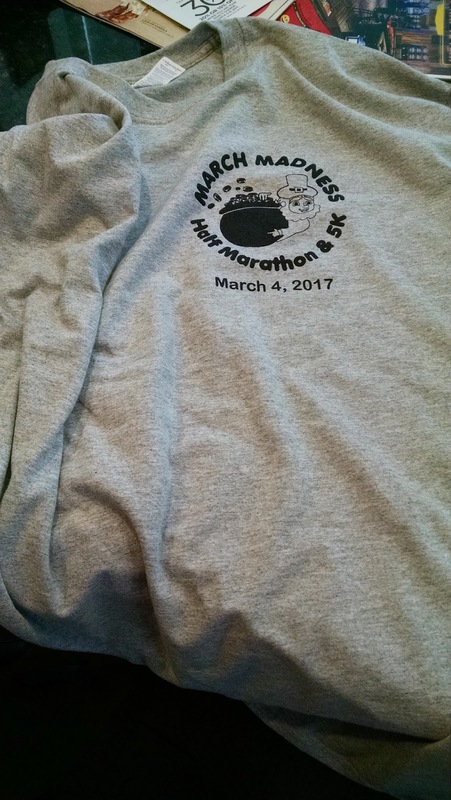 I didn't really have much hope on this one for placing in my age group. Only the top person from each age group got an award and I figured with all the guys who were running a solid pace or who had passed me would certainly leave me out of the running. However, when I checked the print out for the race results, I noticed that no one had yet finished in the 45 - 49 age group. Could I have placed? 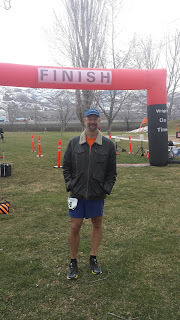 I wound up making small talk with about half a dozen runners (they were a friendly bunch today) and I finally checked back in and the race director, who knows me, saw me, and was like "You won your age group!" Wow... totally unexpected. So I got a finisher's medal and an age group award medal. The race was a steal -- and it was fully supported. However, I do think it could've used another water stop. I believe there was one at mile 1.33, 3.5, and at the turn around. It was a long way to go between water stops and despite it being not terribly hot out, I was dehydrated to some extent by the time I finished. The t-shirt was a repeat of last year's. It is cotton, so it will likely be given away or donated. The finisher's medals were nice and the age group one is engraved with a mention that it was an age group award. After the race, they had water, cookies, pizza, and fruit. Again, for a fairly cheap race, it was a steal. They also had a raffle, including some pretty nice prizes. Unfortunately, my tickets were not picked (aww). Overall, today was a tough day for running. The wind just killed me. I think I would've finished a little faster had there been no wind, but my legs weren't 100% either. I'd do this race again next year. It was well organized, the course was easy to navigate, and a lot of the proceeds went to the local food bank.